Fisher-Price Little People, the role-playing game Dungeons & Dragons and the simple swing are now in the National Toy Hall of Fame. The list of 12 finalists for this year’s honors had included bubble wrap, Care Bears, Clue, the coloring book, Nerf ball, pinball, Rock ‘Em Sock ‘Em Robots, Transformers and Uno. …When it emerged in 1974, Dungeons & Dragons was groundbreaking, says curator Nic Ricketts of The Strong. In addition to its own merits, the game created by Gary Gygax and Dave Arneson established a pattern for how similar role-playing games might work — both on table-tops and, eventually, on computers and other devices. (2) VISUALIZATION. Nancy Jane Moore tells “Why Fiction Matters” at Book View Café. 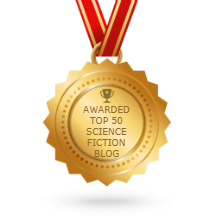 I’ve had several conversations with fiction writers lately on what we should be doing about climate change, the election, and other important concerns of the day. My immediate response was that now, more than ever, they should write. They dismissed that advice. I got the feeling they thought of fiction as a luxury or even an irrelevance at the current time, even though they’re very fine fiction writers. But I wasn’t advising them to indulge themselves or escape into their work. I really believe that fiction – telling stories – is one of the most important things we do as human beings. I believe that because reading fiction is one of the things that made me who I am today. That’s fantasy, the supposedly “escapist” literature. Now I wasn’t telling my fellow writers to write to the exclusion of everything else that needs doing. Other things also matter. Politics matters, despite our habit in the U.S. of disparaging it. We need good people to run for office and work on campaigns, because it’s hard to get anything done when the people in power are stacked against you. Activism matters. We need the people who mass in the streets because Black Lives Matter and those who block pipelines. We also need those who are creating new structures – those building the worker co-ops and social justice entrepreneur programs. Most of all we need a vision, so that we can see where we’re going. And that brings me back to fiction, because stories can give us vision. (3) SEFTON OBIT. Amelia (Amy) Sefton died November 9 from cancer and other medical problems. She was familiar to some fans for going in costume as Madame Ovary. This summer she was named designer in Tor’s the ad/promo department. (Corrected November 12). She was formerly married to Connor Cochran. She was later married to writer James Kilius, who preceded her in death in 2008. (4) REMEMBERING PAUL CALLE. Paul Calle (1928-2010), was a commercial artist renowned as a stamp designer. His most famous stamp, issued in 1969, commemorated the Apollo 11 moon landing. Early in his career, Mr. Calle did cover artwork for science-fiction pulp magazines like Galaxy, Fantasy Fiction and Super Science Stories, as well as for general-interest publications like The Saturday Evening Post. In 1962, he was among the inaugural group of artists chosen for the NASA Art Program, a documentary record of the space program that has produced thousands of works to date. Mr. Calle’s early art for the program includes a pair of 5-cent stamps, issued in 1967, depicting the Gemini capsule and the astronaut Ed White making the first American spacewalk in 1965. On July 16, 1969, the day Apollo 11 was launched, Mr. Calle was the only artist allowed to observe the astronauts, Neil Armstrong, Michael Collins and Buzz Aldrin, as they readied themselves for the mission — eating breakfast, donning their spacesuits and the like. He captured their preparations in a series of intimate pen-and-ink sketches later exhibited at the National Air and Space Museum. You can find Calle’s SF cover art here. (6) MARRY A MARIONETTE. “Faren Miller reviews Keith Donohue” at Locus Online. Keith Donahue’s The Motion of Puppets opens with a bold statement from the heroine’s perspective: ‘‘She fell in love with a puppet.’’ Kay Harper loves the ancient thing – body ‘‘hewn from a single piece of poplar,’’ simple limbs designed for lost connections, ‘‘pierced at the hands and feet’’ – not just for its beauty and rarity but ‘‘because he could not be hers.’’ Note those dueling pronouns: what would be it to most observers is he for both the woman and (less ardently) for the author of this novel where some objects are very much alive. Keith Donohue’s modern take on old myths and fairy tales brings sentient puppets closer than Kay could ever imagine, when she becomes one herself. Though the metamorphosis was unintended, and doesn’t lead to Ovidian antics, it’s still a kind of betrayal, since she leaves a bewildered human husband, Theo. (7) TAKE DOWN THE INTERNET. David Brin is already moving on to the next disaster — “Shining light on cyber-secrets”. “These probes take the form of precisely calibrated attacks designed to determine exactly how well these companies can defend themselves, and what would be required to take them down. It feels like a nation’s military cyber-command trying to calibrate its weaponry in the case of cyberwar.” Who might do this? “The size and scale of these probes — and especially their persistence — point to state actors. … China or Russia would be my first guesses.” Among my list of Proposals for the new administration, that I’ll issue in January, is to tell all citizens that their computers and printers etc may serve as botnet hosts, and that every person will share in tort liability for any major Net Disaster, unless they have at least tried, twice a year, to download a reputable anti-malware program. (8) CLIMATE CHANGE. Ashley R. Pollard reviews some movies screening in the UK in her post for Galactic Journey: “[November 10, 1961] Earth On Fire (UK Sci-Fi Report)”. The Day the Earth Caught Fire stars Edward Judd, Leo McKern and Janet Munro and starts in a most striking manner with Judd’s character walking in sweltering heat through the deserted streets of London. The story then flashes back to how it all began when both the Americans and Russian simultaneously exploded atomic bombs at the Earth’s poles. This caused both the axial tilt to change and also shifted our planet in its orbit around the Sun. (9) THE GOOD OLD DAYS. And if you ever wondered whether the good old days were actually any good, try these antique newzines – Fanac.org is scanning and posting old issues of File 770 and Andrew Porter’s Science Fiction Chronicle. (10) STFNAL TIME TRAVEL. In “Can We Escape From Time?” by John Lanchester, on the New York Review of Books website, Lanchester uses his review of James Gleick’s book on time travel to give an overview of how sf authors, including Wells and Heinlein, have examined the time-travel theme in their works. James Gleick’s illuminating and entertaining Time Travel is about one of these once-new stories. We have grown very used to the idea of time travel, as explored and exploited in so many movies and TV series and so much fiction. Although it feels like it’s been around forever, it isn’t an ancient archetypal story but a newborn myth, created by H.G. Wells in his 1895 novel The Time Machine. To put it another way, time travel is two years older than Dracula, and eight years younger than Sherlock Holmes. The very term “time travel” is a back-formation from the unnamed principal character of the story, whom Wells calls “the Time Traveller.” The new idea caught on so quickly that it was appearing in the Oxford English Dictionary by 1914. Wells is described by Gleick as “a thoroughly modern man, a believer in socialism, free love, and bicycles.” He was a serious thinker in his own way, forceful and coarse-grained, but the invention of the time machine wasn’t one of his deep philosophical conceptions. It was instead a narrative device for a story with two cruxes, one of them political-philosophical and the other imaginative. Its main argumentative point comes when Wells travels to the far future and finds that humanity has evolved into two different species, the brutish, underground-dwelling Morlocks and the etiolated, effete, surface-living Eloi. This, Wells implies, is what could happen if current trends toward inequality continue unchecked. This was an argument worth making in 1895, and worth being reminded of today, but it’s not what most readers remember from The Time Machine. Instead, as Gleick points out, the abiding memory of the story comes from the Traveller’s journey to the final days of the earth, the dark and cold and silent stillness of the dying planet circling the dying sun. It is an atheist’s unforgettable vision of the absoluteness of death. (11) BACK TO THE BANG. Christopher Lloyd will make a guest appearance on the Big Bang Theory episode airing December 1. In addition to The Big Bang Theory, Lloyd is set to make an appearance during Season 3 of the Syfy series 12 Monkeys. Earlier this week, it was revealed that Warner Bros. TV and CBS are currently at work on a spinoff/prequel of The Big Bang Theory. Jim Parsons is executive producing the series, which will center around a young Sheldon Cooper. (12) SPACE BUSINESS. “Full Ariane 6 rocket funding is unlocked by ESA” reports the BBC. The final tranche of R&D funding needed to introduce a new rocket for Europe was committed on Wednesday. The European Space Agency has amended an August 2015 contract with Airbus Safran Launchers (ASL), to unlock a further €1.7bn (£1.5bn; $1.9bn). It tops up initial monies of €680m and means ASL can now complete development of the Ariane 6. This new rocket will replace the Ariane 5 but, crucially, aims to cut current launch prices in half. The move to a new vehicle is seen as vital if Europe is to maintain its competitive position. (13) HIT THE DECK. A piece on the Seattle Times website by Jayson Jenks called “Seahawks’ Cassius Marsh Has $26,000 in Magic: The Gathering Cards Stolen from His Car” says the Seahawks’ defensive end had someone break into his car and steal two backpacks with his iPad and $20,000 in Magic: The Gathering cards, and if the thief returns them, he gets two tickets to the next Seahawks home game, no questions asked. (14) DAVE KYLE ART FOR SALE. 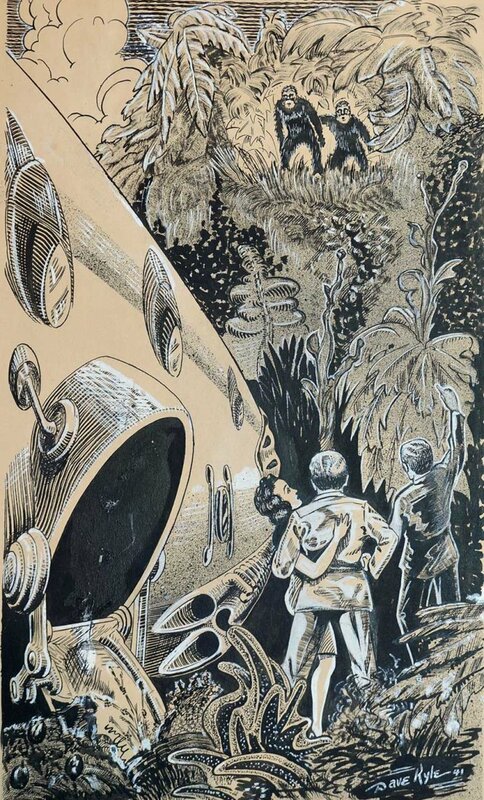 Dave Kyle original pulp magazine Illustration artwork is going under the hammer at Live Auctioneers. This example is the original artwork published April 1942 in Future Combined with Science Fiction.